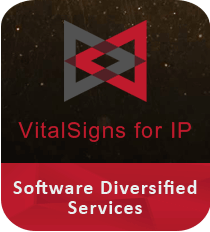 VitalSigns for IP is a robust IP monitor for mainframes, TCP/IP networks and z/OS communication servers. The program provides IP network monitoring, FTP monitoring, OSA monitoring, enterprise extender monitoring, and network history reporting. The networking tool helps you proactively resolve various network problems such as speed up response-times, increase throughput and availability, exceed service-level agreement and reduce network outages. The application provides real-time graphic displays of network health, status, performance and traffic at some of the common desktop browsers like Netscape and Internet Explorer. The system utility monitors your entire network and reports which applications are running and who’s using them. Download VitalSigns for IP to monitor status, health and performance of your network. The free network monitoring service can verify service-level agreements and is able to trigger automatic repairs by sending alerts to VitalSigns for Network Automation and Control (VNAC). Basically, VIP monitoring agents on z/OS systems deliver their monitoring data to a single VIP server. The server, in turn, delivers network data in HTML format to users at desktop web browsers. The VIP server often runs on z/OS systems via Unix System Services. However, you can configure VIP agents to report to multiple VIP servers, because the redundancy insures against breakdown. VIP servers can run outside of z/OS systems. They provide same user-end experience for Windows, Unix and Linux. VitalSigns for IP is a reliable and easy-to-use network monitoring utility that detects, diagnose, resolve and prevent mainframe TCP/IP problems on z/OS networks. If you are looking for the best tool to monitor your mainframe network, especially the mainframe IP network, you should opt for VIP for Windows.